J. Robert Oppenheimer is one of the iconic figures of the twentieth century, a brilliant physicist who led the effort to build the atomic bomb for his country in a time of war, and who later found himself confronting the moral consequences of scientific progress. In this magisterial, acclaimed biography twenty-five years in the making, Kai Bird and Martin Sherwin capture Oppenheimer's life and times, from his early career to his central role in the Cold War. This is biography and history at its finest, riveting and deeply informative. 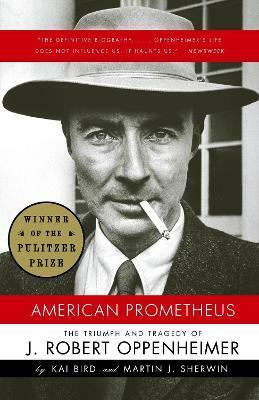 "American Prometheus is the first full-scale biography of J. Robert Oppenheimer, "father of the atomic bomb," the brilliant, charismatic physicist who led the effort to capture the awesome fire of the sun for his country in time of war. Immediately after Hiroshima, he became the most famous scientist of his generation-one of the iconic figures of the twentieth century, the embodiment of modern man confronting the consequences of scientific progress. He was the author of a radical proposal to place international controls over atomic materials-an idea that is still relevant today. He opposed the development of the hydrogen bomb and criticized the Air Force's plans to fight an infinitely dangerous nuclear war. In the now almost-forgotten hysteria of the early 1950s, his ideas were anathema to powerful advocates of a massive nuclear buildup, and, in response, Atomic Energy Commission chairman Lewis Strauss, Superbomb advocate Edward Teller and FBI director J. Edgar Hoover worked behind the scenes to have a hearing board find that Oppenheimer could not be trusted with America's nuclear secrets. "American Prometheus sets forth Oppenheimer's life and times in revealing and unprecedented detail. Exhaustively researched, it is based on thousands of records and letters gathered from archives in America and abroad, on massive FBI files and on close to a hundred interviews with Oppenheimer's friends, relatives and colleagues. We follow him from his earliest education at the turn of the twentieth century at New York City's Ethical Culture School, through personal crises at Harvard and Cambridge universities. Then to Germany, where he studied quantum physics with the world's mostaccomplished theorists; and to Berkeley, California, where he established, during the 1930s, the leading American school of theoretical physics, and where he became deeply involved with social justice causes and their advocates, many of whom were communists. Then to Los Alamos, New Mexico, where he transformed a bleak mesa into the world's most potent nuclear weapons laboratory-and where he himself was transformed. And finally, to the Institute for Advanced Study in Princeton, which he directed from 1947 to 1966. "American Prometheus is a rich evocation of America at midcentury, a new and compelling portrait of a brilliant, ambitious, complex and flawed man profoundly connected to its major events-the Depression, World War II and the Cold War. It is at once biography and history, and essential to our understanding of our recent past-and of our choices for the future. Kai Bird is the author of The Chairman: John J. McCloy, The Making of the American Establishment and The Color of Truth: McGeorge Bundy and William Bundy, Brothers in Arms. He coedited with Lawrence Lifschultz Hiroshima's Shadow: Writings on the Denial of History and the Smithsonian Controversy. A contributing editor of The Nation, he lives in Washington, D.C., with his wife and son. Martin J. Sherwin is the Walter S. Dickson Professor of English and American History at Tufts University and author of A World Destroyed: Hiroshima and Its Legacies, which won the Stuart L. Bernath Prize, as well as the American History Book Prize. He and his wife live in Boston and Washington, D.C.